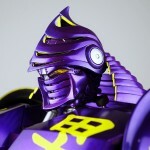 3A has released a great set of new photos for their upcoming Real Steel Noisy Boy 1/6 Scale Figure. The figure is due to go on sale November 1st at Bambaland Store at 9AM Hong Kong time. The figure will be priced at $380. Read on for the full gallery and some additional info. ThreeA has released new photos of their upcoming Real Steel Noisy Boy1/6 Scale Figure. Not only does it feature some amazing detail, but the Noisy Boy figure has over 500 (yes five hundred) LED lights. It stands a little over 17″ tall. If you buy the figure from their Bambaland Store, you will get an exclusive 1/6 scale headset and controller from the film.The figure goes on sale November 1st. Read on to see the pics. Keep in mind, the photos are very large. Open the thumbnail links in a new tab or save them to check them out full size. There was a lot more than that. Read on for a selection of images or check out the full gallery at OneSixthRepublic.